One night’s lodging in a beautiful, roomy suite, with a full kitchen, and washer & dryer. You get free Wifi & cable TV. *Subject to availability, through 05/14/2019. Taxes and fees apply. 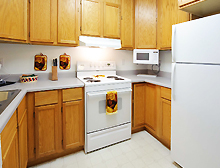 One Queen-Bed Suite, featuring a full kitchen, washer/dryer, Internet & cable TV. *Please note: 30-consecutive-night stays must be paid in-full at time of check-in. *Subject to availability, through 05/14/2019. Taxes and fees may apply. One night’s lodging in one of our spacious double Queen Suites featuring two queen beds in a separate bedroom, living room, full kitchen, washer/dryer, and free Wifi & cable TV.